June 30, 2017 — On Tuesday, June 27, the EPA formally proposed a rule to rescind the Obama administration’s 2015 Clean Water Rule, which extended the authority of the federal government to regulate pollution in more wetlands and tributaries. This announcement comes 6 weeks after the EPA released a statement about the new “Waters of the U.S.” (WOTUS) website dedicated to explaining the history of the definition of WOTUS and the rulemaking and revision process. When the new website came online, the previous Clean Water Rule website (www.epa.gov/cleanwaterrule) began redirecting to the single www.epa.gov/wotus-rule URL. This website overhaul, described in our latest Access Assessment Report, resulted in access reduction to information pertaining to the benefits of clean water and the Clean Water Rule, as well as the complete removal of certain pages from the EPA’s website, which the EPA does not address in their statement. While many of the resources on the Clean Water Rule website are archived, previous Clean Water Rule pages that were taken offline do not redirect to these EPA archives and the new WOTUS website does not facilitate access to the EPA archives either, rendering these resources nearly inaccessible to EPA website visitors. Left: a screenshot of the EPA’s Clean Water Rule Website as it appears on the EPA Web Archive, mirrored on May 10, 2017. 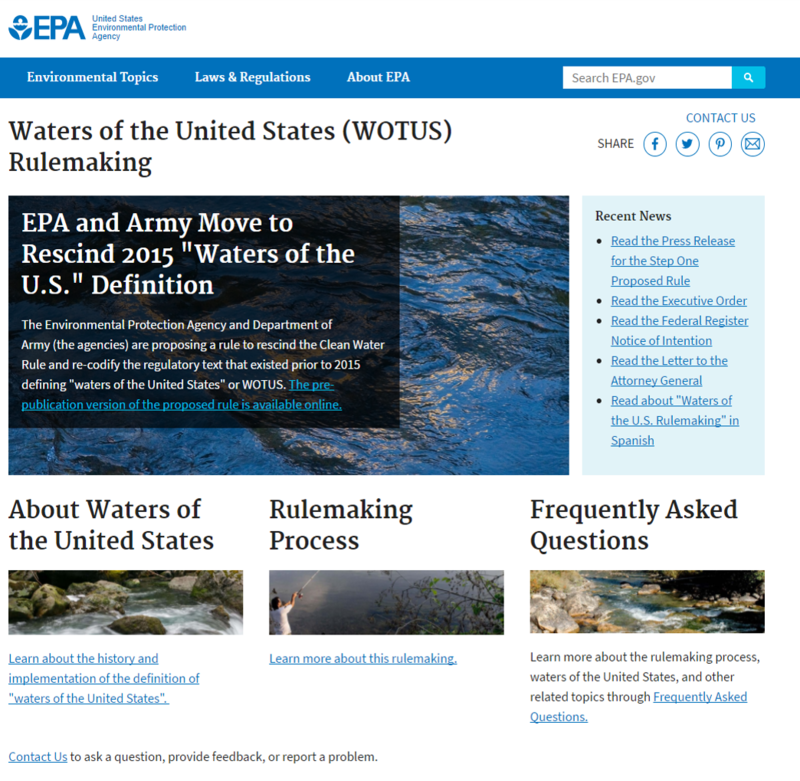 Right: a June 29, 2017 screenshot of the EPA WOTUS website. The Clean Water Rule, finalized in 2015 and also known as the WOTUS Rule, focuses on creating more thorough definitions of WOTUS, which are the waters that the EPA has authority to regulate under the Clean Water Act. The EPA justified the need for better definitions through explanations of how tributary and adjacent bodies of water can impact the water quality of navigable waterways, which the EPA is explicitly charged with protecting. Many of the resources that were previously on the Obama-era EPA website dedicated to the Clean Water Rule, online since February 2015, pertained to information about clean water, influences on water quality, and the relevance of water quality to communities. The EPA’s new website instead focuses entirely on the history of the definition of WOTUS and actions resulting from President Trump’s Executive Order 13778 requesting the review of the Clean Water Rule’s definitions. The new website, conspicuously avoiding the term clean water in its name and the general topic of clean water, does not include valuable resources that were previously available to the public about the benefits of streams and wetlands, influences on water quality, or basic hydrology. 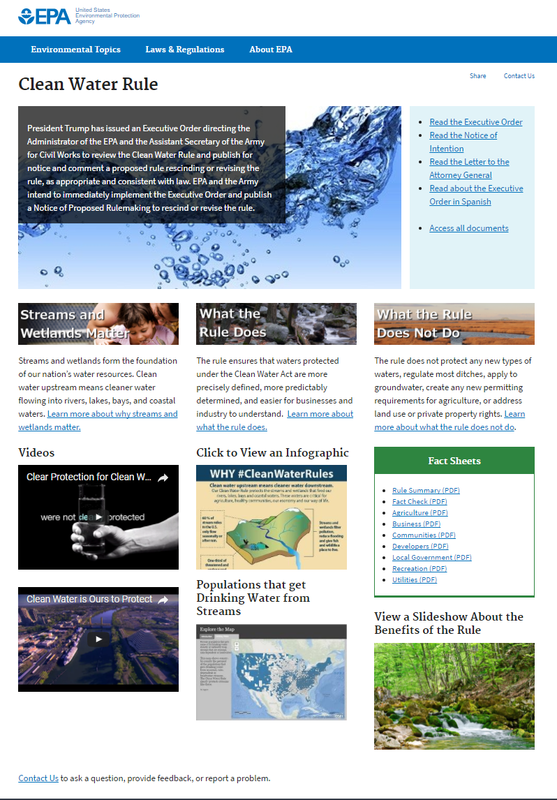 Among the resources removed from the website is a series of factsheets describing the importance of the Clean Water Rule to various stakeholders, an interactive map visualizing “populations that get drinking water from streams,” and a page about the value of protecting streams and wetlands. It is unclear from the news release or new WOTUS website why the additional pages based on the executive order were not simply added to the previously existing, now removed, Clean Water Rule website, such that the plethora of resources there would remain accessible to the public. Much of this information—though not all—is available through the EPA Web Archive. However, there was less than 24 hours’ notice of the massive website overhaul and redirection, and no information about or link to the previous website is available from the redirected homepage. Moreover, none of the removed pages redirect to the archives, but instead redirect to the current WOTUS Rule homepage. Clean Water Rule resources and information are now much more difficult to find: From the WOTUS Rule homepage, there is a link to “Learn about the history and implementation of the definition of ‘waters of the United States’,” and on that page there is a section labeled “Clean Water Rule.” In the Clean Water Rule section there is a bullet point noting that the previous Clean Water Rule website can be found in the EPA Web Archive, but it does not provide a link or instructions on how to find the web archive, let alone how to navigate to the Clean Water Rule page within the web archive. While the EPA news release about the website overhaul and the archiving of the prior website are good practice, without a longer notice period and more visible paths to the previously available content, this website overhaul significantly impedes public access to information about clean water and the Clean Water Rule. The recent Clean Water Rule website overhaul, to create a new website that focuses exclusively on the rulemaking process and definition of the “waters of the United States” rule, reduces public access to information and resources regarding clean water. A better information governance approach would be to include the previously existing resources from the Clean Water Rule website along with the new website’s content, maintaining public access to information and resources.